Today is the first day of Spring and loads of people on social media are pretty excited about it. In Miami, it’s just another warm, humid, sunny day. As a teacher what really excites me is that today is my last day of work for the next ten days. As a home cook what really excites me are all the spring vegetables that are now (or will be soon) available to cook with. Asparagus, artichokes, peas, scallions, and radishes round out some of my favorite Spring vegetables. 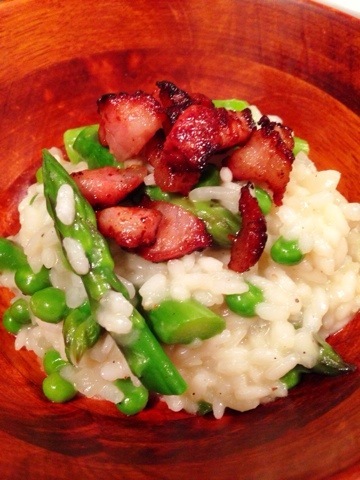 This risotto incorporates two of those veggies, asparagus and peas, and adds some crispy pancetta…because why not? If you’re not a good multi-tasker then it’s best to get your veggies and pancetta ready first and then focus on the risotto. In a small pot, blanch the asparagus pieces for 3-4 minutes and place in an ice bath to stop the cooking process. Throw in the spears for the last-minute. Place aside. If you’re using fresh peas steam them for about 2 minutes. Place aside. If using frozen then prepare according to the package directions. For the pancetta–in a small pan over medium heat cook the pancetta until it begins to brown and crisp. Drain the oil and place the pancetta aside. Now you’re ready for the rice. Making risotto is a labor intensive process that requires you to be at the stove for 20-30 minutes so make sure you have the time carved out before you begin. Bring your stock to a boil and then lower the heat to a simmer. In another pot, over medium heat, coat the bottom with a couple of tablespoons of olive oil and sweat your onions until slightly translucent. Pour in the rice and stir until it has all be coated with the oil and onions. Pour in a small amount of stock and keep stirring until all the liquid has been absorbed. Pour in another small batch of the stock and repeat this process until the rice develops a creamy, al dente texture. You must constantly stir! Fold in the peas, asparagus, and lemon zest for the last 3-5 minutes of the rice cooking. Your rice should be creamy and smooth. If it’s too thick then continue to add stock or water until you reach the desired texture. Add the pancetta, half of your grated parmesan cheese, stir, and plate and eat immediately! Use the remaining cheese to sprinkle on top. My girlfriends and I are always looking for new blogs. Your blog is wonderful. I’m a huge fan of “Cooking With Mr. C.” and “Food 52”. “Cooking With Mr. C. is a teacher also. It’s a cool story how he has shot into the spotlight. I will share your blog with my friends. We love to follow many blogs.